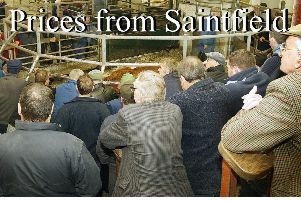 An exceptional show of good quality cattle at Wednesday’s sale with trade remaing firm in all sections. FAT COWS: Sold to a top of £1,269 for 830kg Hereford £153. Leading prices: Dromara producer Hereford 830kg, £153, £1,269, Carryduff producer Limousin 680kg, £177, £1,203, Limousin 670kg, £158, £1,058, Crossgar producer Hereford 650kg, £176, £1,144, Killinchy producer Aberdeen Angus 840kg, £136, £1,142, Downpatrick producers Limousin 690kg, £162, £1,117, Limousin 680kg, £144, £979, Friesian 690kg, £136, £938, Saintfield producer Aberdeen Angus 690kg, £155, £1,069, Lisburn producers Limousin 670kg, £151, £1,011, Limousin 650kg, £154, £1,001, Limousin 650kg, £132, £858, Crossgar producer Hereford 610kg, £161, £982, Comber producer Holstein 760kg, £124, £942, Limousin 680kg, £134, £911, Ballygowan producer Friesian 640kg, £147, £940, Aberdeen Angus 500kg, £183, £915, Ballynahinch producer Belgian Blue 630kg, £143, £900, Comber producer Holstein 710kg, £123, £873 and Killinchy producer Limousin 630kg, £130, £819. BEEF BULLOCKS: Sold to a top of £1,311 for 690kg Limousin £190. Leading prices: Ballywalter producer Limousin 690kg, £190, £1,311, Aberdeen Angus 730kg, £175, £1277, Ballynahinch producer Charolais 660kg, £194, £1,280, Charolais 640kg, £190, £1,216, Charolais 630kg, £188, £1,184 and Comber producer Charolais 660kg, £190, £1,254, Limousin 600kg, £197, £1,182, Limousin 610kg £190, £1,159. HEIFERS: Sold to a top of £1,160 for 580kg Aberdeen Angus. Leading prices: Saintfield producers Aberden Angus 580kg, £1,160, Hereford 580kg, £1,105, Aberdeen Angus 540kg, £1,100, Hereford 590kg, £1,045, Limousin 510kg, £1,035, Hereford 510kg, £930, Aberdeen Angus 430kg, £875, Ballygowan producer Charolais 550kg, £1,140, Killinchy producer Simmental 580kg, £1,120, Downpatrick producers Limousin 580kg, £1,100, Limousin 560kg, £1,100, Limousin 530kg, £1,030, Limousin 500kg, £1,020, Blonde d’Aquitaine 540kg, £1,000, Limousin 530kg, £995, Limousin 500kg, £985, Limousin 500kg, £980, Blonde d’Aquitaine 490kg, £970, Charolais 500kg, £970, Charolais 400kg, £860, Comber producer Simmental 600kg, £1,070, Simmental 580kg, £1,045, Simmental 570kg, £1,000, Simmental 590kg, £1,000, Ballynahinch producer Charolais 570kg, £1,055, Charolais 560kg, £1,000, Donaghadee producer Belgian Blue 580kg, £1,000, Greyabbey producer Limousin 410kg, £890, Limousin 410kg, £800, Hillsborough producer Hereford 490kg, £860, Lisburn producer Limousin 480kg, £850, Charolais 340kg, £795, Hereford 360kg, £770 and Crossgar producer Limousin 340kg, £840, Limousin 380kg, £800. BULLOCKS: Sold to a top of £1,315 for 600kg Limousin. Leading prices: Comber producers Limousin 600kg, £1,315, Simmental 540kg, £1,180, Simmental 530kg, £1,130, Charolais 460kg, £1,130, Parthenais 480kg, £1,110, Charolais 410kg, £1,105, Simmental 530kg, £1,075, Shorthorn 550kg, £1,060, Charolais 560kg, £1,050, Saintfield producers Limousin 520kg, £1,260, Limousin 540kg, £1,200, Limousin 500kg, £1,180, Limousin 520kg, £1,165, Limousin 490kg, £1,050, Simmental 460kg, £1,010, Groomsport producer Aberdeen Angus 500kg, £1,180, Aberdeen Angus 500kg, £1,140, Belgian Blue 550kg, £1,090, Hereford 530kg, £1,040, Belgian Blue 520kg, £970, Donaghadee producer Belgian Blue 660kg, £1,155, Carryduff producer Charolais 450kg, £1,115, Ballynahinch producer Limousin 460kg, £1,110, Limousin 470kg, £1,095, Limousin 450kg, £1,090, Limousin 420kg, £1,060, Limousin 440kg, £1,050, Limousin 430kg, £1,045, Limousin 400kg, £1005, Belfast producer Limousin 440kg, £1,070, Crossgar producer Sim 500Kg £1050, Downpatrick producers Lim 430Kg £1030, lim 380kg, £1,000, Limousin 400kg, £970, Ballynahinch producer Limousin 390kg, £980 and Greyabbey producer Limousin 380kg, £975. DROPPED CALVES: Sold to a top of £365 for Aberdeen Angus bull calf and £270 for Belgian Blue heifer calf. WEANLINGS: Sold to a top of £425 for Belgian Blue bull calf.